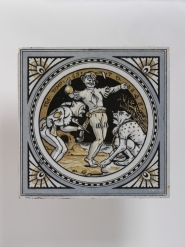 Collecting Victorian Tiles. Woodbridge : Antique Collectors Club, 1979. pp126-9. Austwick, J & B. The Decorated Tile. London : Pitman House, 1980. p147. 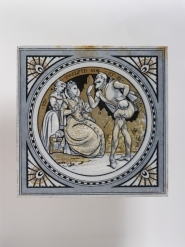 Dust-pressed earthenware tiles, transfer-printed (block-printed) with designs by John Moyr Smith depicting scenes from Shakespeare: Midsummer's Night Dream, Act IV, scene i; Macbeth, Act III, scene IV. These designs are referenced in Lockett, Terence. Collecting Victorian Tiles. Woodbridge : Antique Collectors Club, 1979. pp126-9.